Men's Wearhouse shares are taking a dive after it killed off the "buy one, get 3 free" suit sale at Jos. A. Bank. It's only going to get worse for Men's Wearhouse. The stock price for Men's Wearhouse (MW) fell 23% Thursday, the day after the company said sales were plunging at its subsidiary Jos. A. Bank. during the current quarter. The sales plunge occurred after the company ended Jos. A. Bank's long-standing "Buy 1, Get 3 Free" suit sales in late October. Same-store sales dropped 35% at Jos. A. 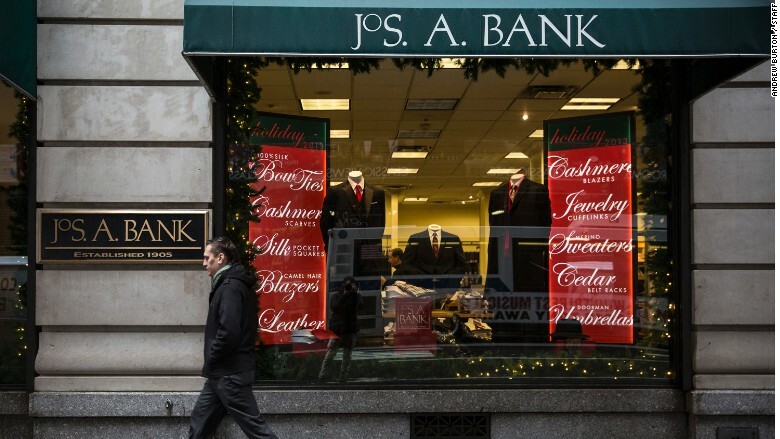 Bank during November and the first week of December compared to the same period last year, the company said. The previous quarter ended Oct. 31. Men's Warehouse, which acquired Jos. A. Bank last year, said it runs the risk of missing the lower end of its guidance numbers "if the Jos. A. Bank trend continues through the remainder of the quarter." Men's Wearhouse said Jos. A. Bank's famous suit sales had become "less appealing" to customers as "they filled their closets" with discount suits. Even Saturday Night Live took a dig at the company, with a sketch capitalizing on the cheap perception of its suits by using them instead of paper towels to mop up messes. But on Wednesday, Men's Wearhouse CEO Doug Ewert acknowledged that getting rid of the deal was taking an unforeseen toll on the company. "When we first acquired Joseph Bank, we knew that we needed to correct the promotional model," he said, in his earnings report. "However, we underestimated the impact to the near-term performance as we began to execute the difficult, but necessary, corrective steps." He indicated that the damage to the brand would be temporary. "We remain confident that these steps will restore a long-term, sustainable, profit model and reshape the business for a health and growing Jos. A. Bank," he said. The company also pointed out that same-store sales increased more than 5% at its other brands, during the same time they nose-dived for Jos. A. Bank. For the third quarter, Men's Wearhouse reported a loss of nearly 3% in company-wide net sales. Men's Wearhouse was founded by the fashionable curmudgeon George Zimmer, who became famous for his commercials, where he vowed in his gravelly voice, "You'll like the way you look, I guarantee it." But he was forced from the company in 2013 in a dispute with the board of directors. He has since formed a new company called zTailors, an online marketplace for tailors.